Saraswati (Sanskrit: सरस्वती नदी sárasvatī nadī) is the only Indian River of ancient times, which was referred to many times in Vedas. It was called Ambitame, Naditame, Devitame – the Best of mothers, Best of rivers and Best of goddesses in the Rig Veda. There are many vedic, puranic and historical events connected to this river, yet it is non-existant today. Entire hymns are dedicated to it in Rigveda, verses [6.61], [7.95] and [7.96 ]. This river has seen prosperity of the most ancient language on earth (Sanskrit), birth of a great civilization, end of an era with Mahabharata war. The Indus-Saraswati Valley civilization is now found to be a collection of nearly 2,500 settlements of various periods along the Saraswati and other rivers, some of which date earlier than 6000 BC. These sites show sure signs of having cultural elements in common with later Vedic culture. The Indus script was first dismissed as imagistic, but has since been found to be very similar to the later Brahmi script, and is possibly related to early Semitic scripts from which the present-day alphabet developed. Nearly 10000 years ago, many rivers were flowing from Himalayas and ending in arabian sea. Western Rajasthan was green and fertile with abundant river waters and copious rains helping many civilizations prosper on their banks. Nearly 6000 years later, River Saraswati started drying up and other rivers changed their course. Rajasthan dried up and ended as arid desert where hot winds piled up dunes of sand. In Vedas and ancient scriptures, Saraswati river was referred by various names like Markanda, Hakra, Suprabha, Kanchanakshi, Visala, Manorama etc. Rig Veda describes it as one of seven major rivers of Vedic times, the others being, Shatadru (Sutlej), Vipasa (Beas), Askini (Chenab), Parsoni or Airavati (Ravi), Vitasta (Jhelum) and Sindhu (Indus). Jhelum changed its course in 1552-55 AD and Beas changed its course during 1996 flash floods. Infact, Punjab got its name due to Punj(Five) rivers flowing through its land. India was the name given by europeans due to the Indus Valley Civilization that was believed as root of all civilizations in this land and they had to cross Indus River to enter into this country. But, India had much older history and today, Indus river flows through Pakistan, but not India. Many attempts have been made by modern day archaeologists with the help of references in vedic texts, to discover the route map and river beds of dried up Saraswati river. The Nadistuti hymn in the Rigveda (10.75) mentions the Saraswati between the Yamuna in the east and the Sutlej in the west, and later Vedic texts like Tandya and Jaiminiya Brahmanas as well as the Mahabharata mention that the Sarasvati dried up in a desert. Kartikeya was anointed the Commander of Deva forces on its banks. Pururava, the scion of Lunar Dynasty, met his wife-to-be Urvashi while galloping along the Saraswati. Mahabharat War was fought along the banks of Saraswati. The Ghaggar-Hakra River (Devnagri: घग्गर हकरा, Gurmukhi: ਘੱਗਰ ਹਕਰਾ, Shahmukhi: گهگـر هکره) is an intermittent river in India and Pakistan that flows only during the monsoon season. It is identified as the Vedic Sarasvati River, as its riverbed is 3 to 10 kilometers wide at places proving that it had indeed been a mighty river once. 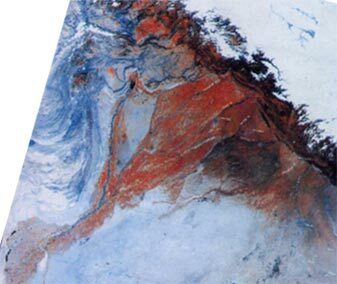 Advanced imagery from the Satellites have also been used to trace the dried river route and its beds. About 5000 years ago, the flow of Saraswati was supplemented by the waters of Yamuna and Satluj both of which are perennial rivers from Himalayan glaciers. When we envision the combined volume of these three, we can actually visualize the magnificence of Saraswati as extolled in Vedas. Saraswati originated from the Har-ki-Dun glacier in West Garhwal, Bandarpunch massif in the Himalayas, along with the river Yamuna. The two rivers flowed parallel for some distance and later joined, proceeding south as the Vedic Saraswati. The seasonal rivers and rivulets, including Ghaggar, joined Saraswati as it followed the course of the present river through Punjab and Haryana. River Sutlej (Shatadru in Sanskrit), joined Saraswati as a tributary at Shatrana, approximately 25 km south of the modern city of Patiala. Saraswati then followed the course of Ghaggar through Rajasthan and Hakra in Bhawalpur before emptying into the Rann of Kutch via Nara in Sindh province, running parallel to the Indus River. In the Jaisalmer district of Rajasthan, even with very little rainfall (less that 150 mm) and extreme weather conditions, groundwater is available at a depth of 50-60 meters and wells in the vicinity do not dry up throughout the year. Groundwater samples exhibit negligible Tritium content indicating ABSENCE of modern recharge. Independent Isotope analyses have also corroborated this fresh water stored UNDER the sand dunes and Radiocarbon data suggests the groundwater is at least a few thousand years old. These locations are on the dry river bed of Saraswati. Bhagavata Puran, describes that Balarama, elder brother of Krishna, was responsible for the alteration of the course of river Yamuna which was originally a major tributary of Saraswati. Because of these dramatic turn of events, the denizens of the Indus-Saraswati had to relocate Northwards, and Eastwards. The eastward movement formed the major chunk of migration and the sacred attributes of Saraswati were gradually transferred to the other major river of the sub-continent, the Ganga. Community of Saraswat Brahmins still trace their origin from the banks of Saraswati and are today spread all over the country right from Kashmir in the north to Kutch in the West to the Konkan region in the South of India. 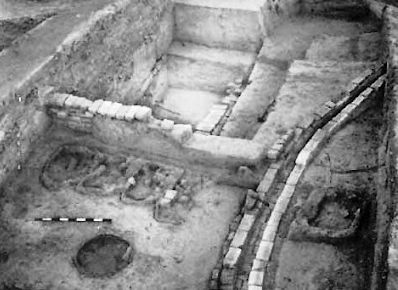 Mahabharata describes (1.90.25-26) that many great kings used to perform Yagnya on River Saraswati’s banks, which co-relates well with the abundance of fire-altars discovered at places like Kalibangan, a major Harrapan town located on the southern banks of the Ghaggar. Mahabharata also describes Saraswati as a disappearing river, and names the place she vanished at as Vinashana or Upamajjana. There is also a mention of Balarama traveling from Dwarka to Mathura, crossing river Saraswati, to immerse the ashes of the Yadavs after the battle (looking at above map, one can draw assume that Saraswati once flowed between mathura and dwaraka). Rigvedic Nadistuti sukta enumerates all important rivers from the Ganges in the east up to the Indus in the west in a clear geographical order. Here (RV 10.75.5), the sequence “Ganga, Yamuna, Sarasvati, Shutudri” places the Sarasvati between the Yamuna and the Sutlej, which is consistent with the Ghaggar identification. Verses in RV (Rig Veda) 6.61 indicate that the Sarasvati river originated in the hills or mountains (giri), where she “burst with her strong waves the ridges of the hills (giri)“. It is a matter of interpretation whether this refers only to the Himalayan foothills like the present-day Sarasvati (Sarsuti) river. 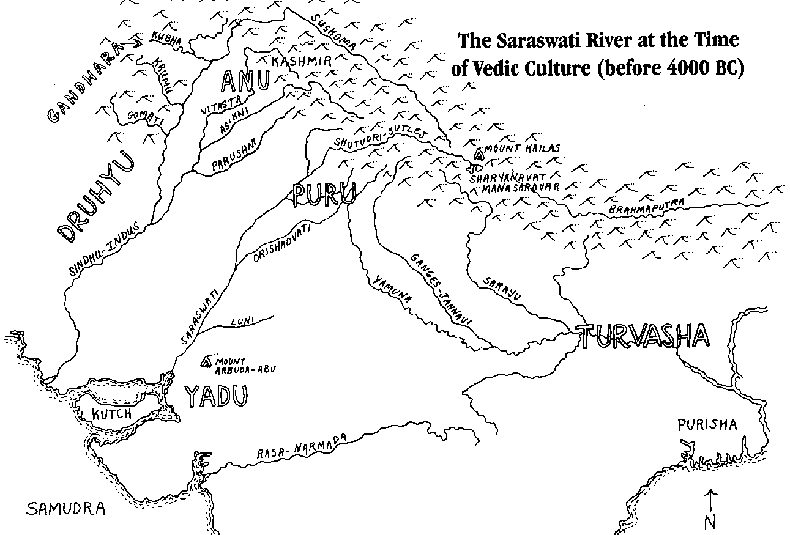 RV 3.23.4 mentions the Sarasvati River together with the Drsadvati River and the Āpayā River. RV 6.52.6 describes the Sarasvati as swollen (pinvamānā) by the rivers (sindhubhih). In RV 7.95.1-2, the Sarasvati is described as flowing to the samudra, a word now usually translated as ocean. This stream Sarasvati with fostering current comes forth, our sure defence, our fort of iron. As on a chariot, the flood flows on, surpassing in majesty and might all other waters. Pure in her course from mountains to the ocean, alone of streams Sarasvati hath listened. Thinking of wealth and the great world of creatures, she poured for Nahusa her milk and fatness. Today, every Indian knows that the River Saraswati is ‘gupt’ – meaning ‘invisible’ – but definitely present in the waters of the Yamuna and joins the Ganga to make the holy Triveni Sangam in Prayag. Infact, the annual 12 days festival of Pushkara (when Jupiter enters each zodiac sign, gods are believed to stay in one river for initial 12 days) for Saraswati river is celebrated when Jupiter enters Gemini (Mithuna Rashi). Gods wanted Badabhaagni (Volcanic Fire) to be transported from earth into sea. They chose Saraswati River for this job and during its course of carrying that immense fire and heat, it slowly dried up and merged the Bhadabhaagni into ocean. Now, this volcanic fire exists in mountains under oceans which occassionally erupt and cause tsunamis. Thus earth was saved from many volnanic mountains. One should try to understand the meaning behind this story. There are many more stories about this river and Goddess Saraswati in Matsya, Skanda, Brahma Vaivarta Puaranas.